I have been researching rail traffic in recent months, and one very important source of traffic, both for loading and unloading freight cars, is the team track. It may not compete with a giant industry for car volume, but steadily hosts a wide variety of car types and loads. Whether in a small town or big city, team tracks are a kind of “universal industry,” with practically any imaginable cargo being loaded or unloaded there. That was the starting point for my column this time. What is interesting to me, beyond the “universal industry” aspect, is that sometimes a small freight shed (far, far less significant than a freight house) would be placed at team tracks where some of the cargo handled might need shelter. Of course, if the team track adjoins a depot, that depot can have a freight room and serve the same purpose. But if a depot is not nearby, a shed may serve the purpose. My article is based on a couple of small, prototype Southern Pacific sheds, which are shown in the column. 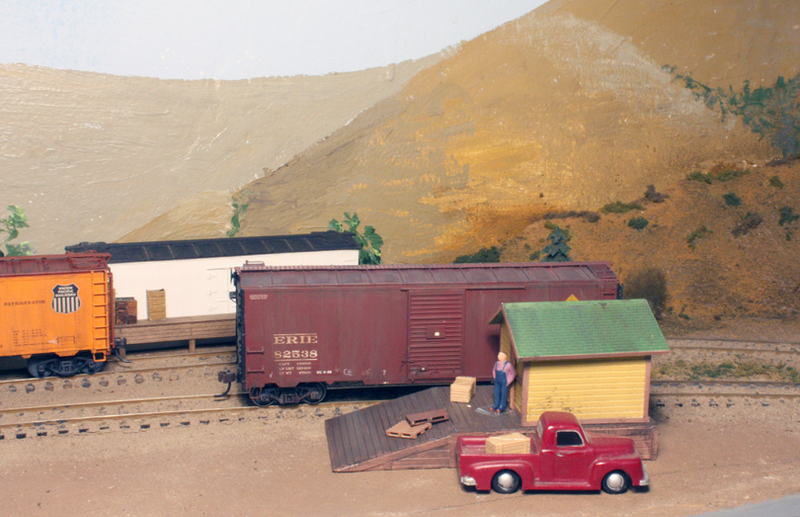 My model shed was very simply built from scratch with styrene strip and sheet of various kinds, amply illustrated in the column, and the shed’s loading dock was built in a similar way. The shed was painted the usual SP color scheme of Colonial Yellow, Light Brown, and Moss Green shingle roof, applied to structures used by or readily visible to the public. 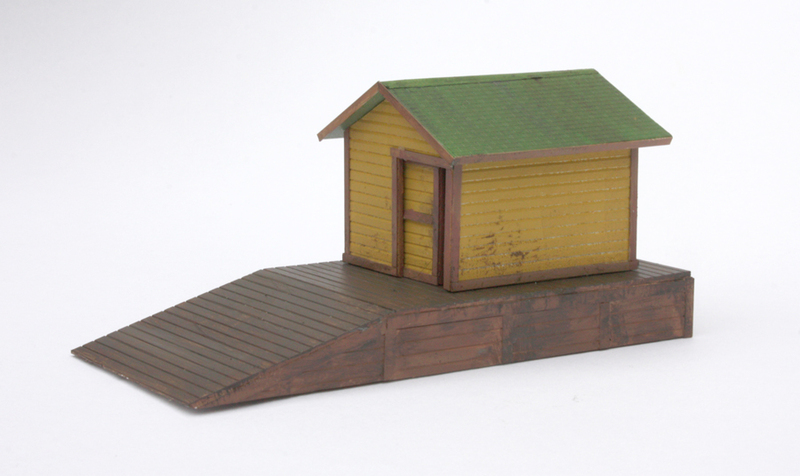 Here is a view of my model shed, an image that is different from what was used for the column. You can see that the sliding door is modeled as slightly open This building is only 10 x 12 scale feet. In use, a shed like this is simply located conveniently along a segment of team track. Many cargoes may be unloaded or loaded directly between highway trucks and freight cars, but when the cargo needs temporary protection, a shed like this can serve. Here is a view of my completed shed in service at East Shumala on my layout, again a slightly different photo from what I used in MRH. This was an interesting though not difficult project. I can now offer better service to shippers and consignees who use the team track at East Shumala. Everyone needs to buy a copy of Jeff Wilson's "Express, Mail & Merchandise Service" from Kalmbach/Model Railroader. The LCL info is worth the price. "A small town in rural Iowa, for example, might have four grocery stores, two hardware stores, a variety store, and a show store--all of which would receive goods on a regular basis from their distributors on a regular basis via LCL, This is how even a small-town combination depot might rate a car or two of LC per day"
Car or TWO?! Per DAY?! This is major traffic. On my RR, it would mean 1 car/day to the smallest town, 2 cars/day to the two intermediate-larger towns and 3 cars/day to the biggest city. That's 8 cars/day! Overwhelming, so cut it in half to 4-1/2 (one car every other day) and that's still significant traffic. And the need for 10-12 cars just for LCL. I have 2 freight houses with team track, 1 team track and 1 larger city freight house. Five cars/day justifies its own train. After all, LCL was charged at higher rates, so it is a moneymaker. Tony, that's not to knock or disparage your small freight house, I love it, but to show the possibility of major traffic even on small and mid-size layouts.